- All 3 pickups together. The classic 5 way Strat switch options remain the same. 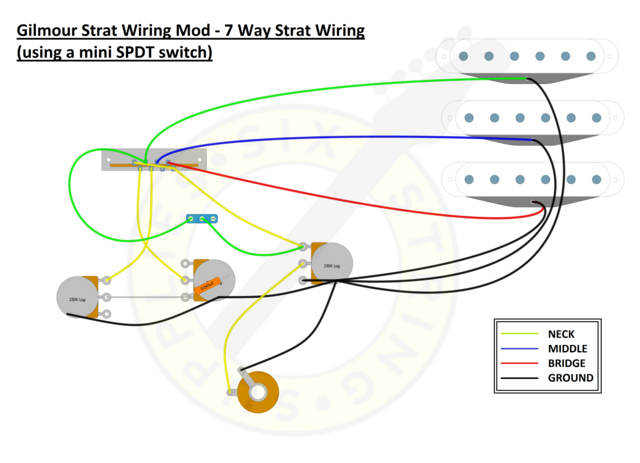 The wiring is exactly the same as standard 5 way Strat wiring - so if you're Strat already has factory wiring, you simply need to add the mini SPDT (single pole double throw) toggle switch. The the neck pickup signal wire (green in the diagram) goes to the volume output via the mini toggle switch. This Gilmour wiring mod is extremely simple to do and adds an extra dimension to your Strat. The flick of switch can offer some unique tones (the neck and bridge for example is best described as having that Telecaster "quack").